Her Excellency Noura bint Mohammed Al Kaabi was appointed as the UAE Minister of Culture and Knowledge Development in October 2017. As Minister of Culture and Knowledge Development, Her Excellency is responsible for the promotion of all UAE cultural fields on both a national and international level. She also sponsors and supports activities to develop and nurture young talent within the community. She previously held the post of Minister of State for Federal National Council Affairs. Her Excellency also holds the position of Chairwoman of the Media Zone Authority - Abu Dhabi (MZA) and twofour54, the home of media and entertainment in Abu Dhabi. 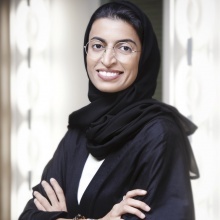 She is Chair of Abu Dhabi Media Company and Chair of Abu Dhabi National Exhibitions Company (ADNEC Group). She is also on the board of the UAE’s National Media Council. Her Excellency is the first UAE national to be ranked in Foreign Policy magazine’s ‘Top 100 Global Thinkers List’. In 2014, she was named as one of Forbes Middle East’s 30 Most Influential Women in Government; and was awarded ‘Business Woman of the Year’ at the Gulf Business Industry Awards. Her role in growing the UAE’s media industry was recognised by America Abroad Media in 2015; and she was named as one of the 20 most powerful women in global television by The Hollywood Reporter in 2016. She has been a WEF young global leader since 2014. H.E. Noura Al Kaabi holds a B.A. in MIS from UAE University and has also completed the Executive Leadership Programme from London Business School.